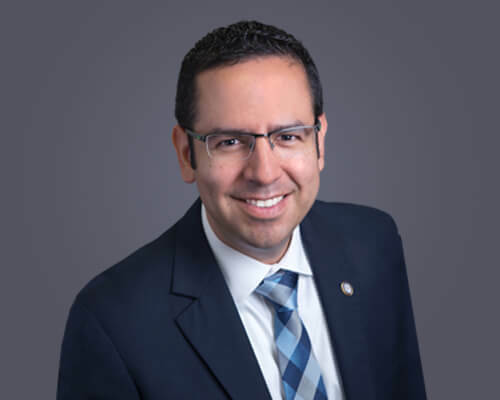 Home » Academics » Schools » Greehey School of Business » Faculty » Sergio Palacios, Ph.D.
Sergio Palacios, Ph.D., is an Assistant Professor of Management (Entrepreneurship and Innovation) at the Greehey School of Business. He joined St. Mary’s University in 2016. He received a bachelor of international business degree from Tecnológico de Monterrey (Monterrey Tech), an MBA from the University of Texas-Pan American and a Ph.D. in management from New Mexico State University (NMSU). Palacios is passionate about teaching. His courses at the Greehey School of Business include The Entrepreneurial Mindset, Innovation and Entrepreneurial Opportunities, Managing Growth, Values-Driven Intrapreneurship, E-Commerce, and 3-Day Startup: Innovation in Action. Prior to joining St. Mary’s, he taught undergraduate courses on e-commerce, operations management and supply chain management. At the MBA level, he taught strategic decision-making and data visualization at NMSU, including one course for the Sandia Laboratories and Los Alamos Laboratories cohort. In 2014 and 2015, he was recognized with the Outstanding Teaching Award for Management Ph.D. students at NMSU. Palacios’ entrepreneurial background includes eight years in food manufacturing and distribution. He founded his first company right after finishing his undergraduate degree. His company developed pre-packaged food products and served retailers such as H-E-B Mexico. His research interests include entrepreneurship and e-commerce. He has published in peer-reviewed outlets such as the International Journal of Bank Marketing, International Journal of Electronic Marketing and Retailing, Business and Society Review and in the proceedings of several conference, including Decision Sciences Institute and Irish Academy of Management. Palacios is an active member of the United States Association for Small Business and Entrepreneurship and Decisions Sciences Institute. His community service includes mentoring at Geekdom and at Business Careers High School in San Antonio, and serving as a panelist, guest speaker and judge in entrepreneurial events (e.g., LaunchSA), and pro bono business consulting.